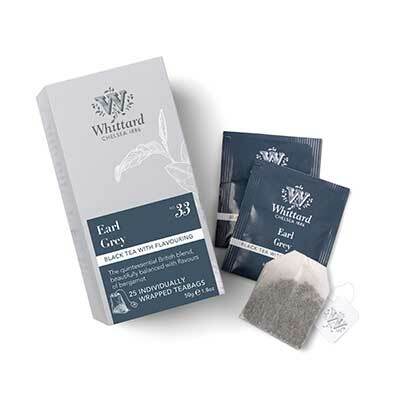 Looking for Earl Grey Teabags? Renowned for its wonderful bergamot aroma, Earl Grey tea has become firmly ensconced as an afternoon tea classic. Our take on the quintessential British blend of fine Chinese and Ceylon black tea is perfectly balanced with flavours of citrussy bergamot – we've even added a scattering of blue cornflower petals for an elegant final flourish. Makes a superb, fragrant cup of tea. More body than you sometimes get with Earl Grey, which prevents it from being too insipid. My absolute favourite. Earl Grey with a twist! I was surprised at how much I really enjoyed this tea, not normally an Earl Grey drinker. The subtle pleasant enhanced citrus (orange-y) fragrance was lovely Earl Grey with a twist! First time trying and it’s now going to be one of my favs. A great night time drink when you want to get cosy with a book. Subtle citrus taste really enhances the earl grey . 5 stars. A really lovely tea. Floral flavour and extra fun as a loose tea because you get to see the cornflower petals in the mix! I have tried many different earl greys and I always come back to buy this one. It tastes just like an earl grey should - smooth and citrusy. Best enjyed by brewing loose leaves in a tea pot, drink black. This is definitely a favourite. The rich heady smell and slight citrus taste is just perfect.rnLovely anytime of the day but best served when the house is quiet and I can sit back and relax. Less perfumed smell than a few other Earl Grey teas on the market. Pleasant taste; quite Earl Grey-ish, yet one of the better I've had in a while. The fragrance smells so nice. I love the twist with orange flavours. I've yet to try it, as i'm saving it for a special occasion. It's both a strong & a delicate scent. I was impressed to find two whole rosebuds on my mini caddy version.